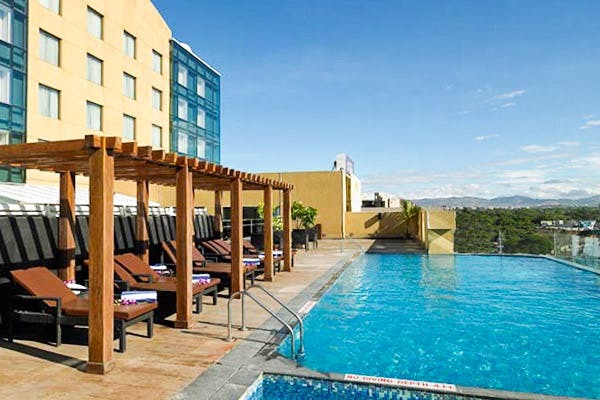 Royal Orchid Central is a gorgeous 4-star business hotel in Pune with luxurious rooms and stunning suites. We, however, love most the fact that it is located right in Kalyani Nagar and has a number of eateries around the place. The hotel is located at Marisoft-I, Annexe Building in Kalyani Nagar. For more details, click here. Royal Orchid Central is one of those splendid properties in Pune that will pamper you silly yet won’t leave you broke. Every room is aesthetically decorated with warm colours and simple furniture and has all basic amenities for a fuss-free staycation. We hear the hotel greets its guests with gourmet chocolates on arrival and includes complimentary buffet breakfast against all bookings. We highly recommend you check out their spectacular executive suites with 316-square-feet of a living room. What’s pleasantly surprising is that the rates per night at Royal Orchid start at INR 4,500 which is quite decent considering the hospitality and ambience of the place. Of course, these rates depend on the rooms you book, season and availability. So, we recommend you check with the hotel before you book. What’s more? The property also has a gorgeous swimming pool with hill views at a distance. There are three beautiful in-house restaurants – Tiger Trail for jungle delicacies, Mix for cocktails and good times and Pinxx for some good coffee over conversations. Get some days off work and live the luxe life at Royal Orchid Central.